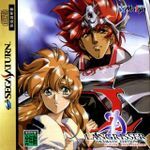 "Langrisser II is the sequel to Warsong, and was never released outside Japan. Langrisser II was also remade on the Super Famicom (SNES) by Masaya as Der Langrisser, which featured multiple paths through the game, greatly reduced difficulty, and improved graphics. A PC-FX port of the SNES version, Der Langrisser FX, was also released, featuring animated cut-scenes. It was later compiled with the first Langrisser for the PlayStation as Langrisser I&II, and then given a script edit and new branch of the Imperial path in its final Saturn remake as Langrisser: Dramatic Edition. A Windows 98 release of the game was released in Japanese, Chinese and Korean; it features redrawn, high-resolution graphics, but a vastly trimmed-down soundtrack to fit the confines of a standard length CD." Source: Wikipedia, Langrisser II , available under the CC-BY-SA License.